Step (1) Cut the plywood sheet into 4 equal pieces. So it took me a while to get the wood squared and even when I pushed the pieces together. I finally accomplished this by cutting 2 pieces together with them facing in the same manner as they would once hinged. Next I (2) lightly sanded the edges and both sides of each piece. After the wood was cut I (3) polyurethane the wrong sided and all the edges. Then it warped some. Ok, more than some... quite a bit. I did get is straightened out mostly by sponging the top and applying heavy weights and clamping it down. Needless to say, I'm now going to do an extra step to make sure the board stay straight for play. While the polyurethane dried completely, I (4) cut out the decals that I made on my computer and had printed at Costco. They look darn good if I do say so myself. I then removed the center hinge since it rests on the right side of the wood so I could paint. In step (5) I taped off for 2 lines 3/4" each running the length of the table on both sides, taped off a triangle 3" from the bottom on each end. The triangles measure 16.5" centered at the bottom and a height of 14" from the center of the triangle. Then I primed the taped off sections and painted them. 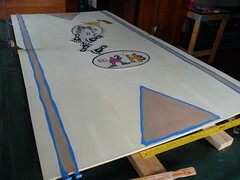 The paint is drying now then the next step will be to position my decals and urethane the top of the table.